Hi, I am interested in your 1967 Volkswagen Beetle (stock #4657-ATL) listed on Autotrader for $15,995. I'd like to get more information about this vehicle and confirm its availability. For a lot of us, the historical significance of classic cars is a big part of their appeal. After all, each one marks a sort of snapshot that marks a distinct period in time. Over the years, few cars have offered a more distinct chronological impact than the humble yet groundbreaking Beetle. It was a fixture overseas for years before Volkswagen introduced the model to American audiences, which took its popularity to an entirely new level. Looking very different from any car on the road at that time or ever since, specimens such as this 1967 Volkswagen Beetle were not only reliable, economical transportation - they came to be a point of identification for an entirely new counterculture. By several accounts that hold weight, the 66,000 or so miles showing on this cars odometer is an accurate reading, so its in good position to offer many future miles of enjoyment. The blue exterior it wears provides a nice, suitably vintage look and, given the cars immediately recognizable form and substantial history, will bring plenty of approval from onlookers in its present state, although a freshening up at the paint booth will make a world of difference and take this classics appeal to a much higher level. Whether you drive it as is or opt for the aesthetic upgrade, this VW has plenty going for it. It remains in factory configuration, with no modifications made. And its collection of chrome and trim, including the bumpers, lights and turn signals have likely already all been replaced - theyre in very good condition. Add to that the strong body alignment on display and you have a very appealing prospect right here. Inside the doors, the Parchment colored interior is in very strong condition and has no doubt been well cared for. The front buckets sport clean white covers and a definite no-nonsense shape to them while providing a surprising level of comfort, and the door panels theyre bracketed by still hold firm to their surrounding steel frames. Despite the Beetles modest size, theres an appreciable amount of interior space on hand - the head and shoulder room and legroom is obvious right off and a pair of normal sized adults really can fit in back. Raise the front deck lid - this is a rear engine ride after all - and youll find plenty of luggage room there as well. The dash area remains in its original configuration as well and is surprisingly clean, with the speedometer behind the steering wheel very clear and readable and the original AM radio positioned at its center. This Beetle is still ready to provide the complaint free transportation it was designed for. The original 1300cc engine stands by in back and sports a carb with an electronic choke for dependable all-weather starting thats now fed by recently replaced fuel lines. Having logged so few miles, it starts right up with a turn of the key and pairs with the also original 4-speed transmission that shifts very precisely. Despite its humble origins, Beetles from this era already featured independent rear suspensions, so the ride on this 67 is surprisingly smooth for a classic of this era. The drum brakes at the four corners are in good working order, so stopping is trouble free as well as this instantly recognizable classic cruises on its set of 15 stock wheels wrapped with Federal Super Steel 657 tires that have plenty of tread left. Take a look below and youll see that the undercarriage has come through the years in strong fashion. 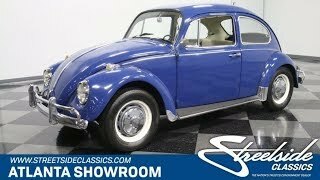 This 1967 Volkswagen Beetle offers the chance to own a very solid, evocative import icon at an attainable price. Call today!